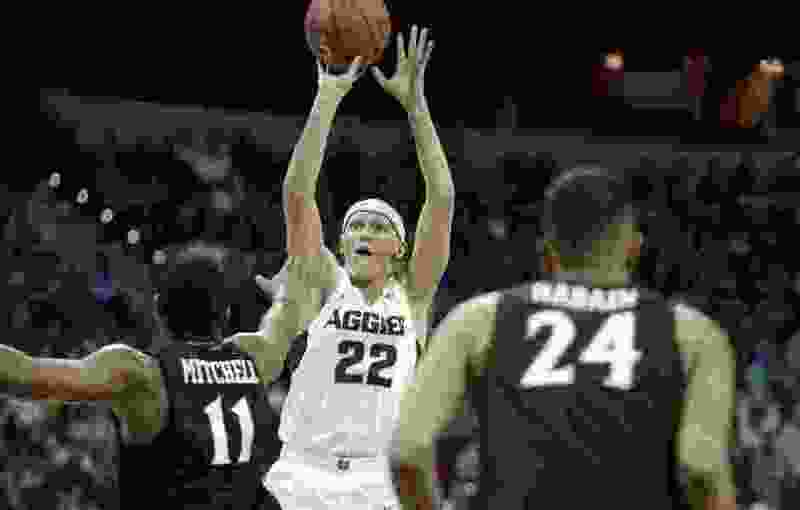 Las Vegas • Utah State practically was guaranteed an NCAA Tournament bid even before taking the court Saturday in the championship game of Mountain West tournament, considering everything the Aggies had done in the past two months. The Aggies’ degree of effort hardly suggested they had locked up anything, as they absorbed everything San Diego State threw at them in its own quest to make the NCAA field. That made USU’s 64-57 victory at the Thomas & Mack Center all the more impressive. Maybe the Aggies didn’t necessarily have to do this, but they went ahead and did it anyway. “To be able to come here and really validate and leave no doubt was really what we were looking for,” said USU coach Craig Smith. USU certainly earned its first NCAA bid since 2011, winning in the program’s first appearance in the MW title game in six years of conference membership. SDSU had knocked off regular-season co-champion Nevada in the semifinals and had every intention of returning to the NCAA Tournament this year. The Aztecs made things as difficult as they could for USU, trailing only 32-30 at halftime. But the Aggies scored the first 13 points of the second half to take a 47-32 lead, via freshman center Neemias Queta’s two inside baskets, Sam Merrill’s only 3-pointer of the game and two more 3s from Brock Miller. After trailing by 15 points, SDSU (21-13) got within five in the last three minutes. Diogo Brito responded with a big play for USU, dribbling through the Aztecs’ press and finding Queta for a reverse layup, and the Aggies stayed in control. “They’re playing incredible basketball,” said SDSU coach Brian Dutcher, whose team gave the Aggies their most recent loss, Feb. 9 in San Diego. The Aggies (28-6) have won 10 straight games and 17 of 18. “For those of us who have been there the last couple of years, it hasn’t been easy,” Merrill said after scoring 24 points and earning the tournament MVP trophy to go with his conference player of the year award. Queta posted 17 points and eight rebounds, besides blocking two shots and anchoring a remarkable defensive performance. The MW Defensive Player of the Year “makes all the difference in the world,” Dutcher said. “You guys have seen it all year; he’s a monster inside,” Merrill said. That was the case Saturday, when USU’s perimeter defenders stayed with the Aztecs’ shooters and Queta kept SDSU from having much success inside. Senior guard Devin Watson led the Aztecs with 18 points, but SDSU shot only 27 percent from the field in the second half and 33 percent for the game against a USU defense that also stifled the Aztecs in a 70-54 victory in Logan in late February. Merrill struggled with his outside shooting against the Aztecs’ aggressive defense in both of USU’s wins over SDSU, going 1 of 9 from 3-point range in each game. His 24 points Saturday came mostly via drives and free throws. The Aztecs had beaten USU 68-63 in San Diego in late February, overcoming Merrill’s 35 points. USU has not done that since 2001. The Aggies have earned the right to try again.